America’s affair with the coffee bean has never been more passionate. While cafés and restaurants perfect coffee concoctions for customers on the go, many consumers are seeking similar results in their own kitchens. 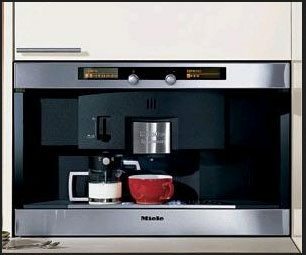 Manufacturers have responded with the emergent built-in coffee station, providing convenience and a perfect cup of joe. 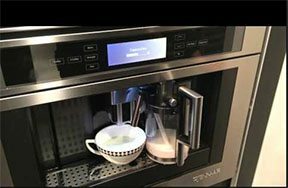 We took a look at available features on these new “must-haves” for the modern kitchen: the built-in coffee system. Jenn-Air’s Built-in Coffee System (top right) offers complete beans-to-espresso and brewed coffee operation. The center stores beans, grinds them, and even provides a grinds disposal unit for the espresso grounds “puck.” This unit has an easy to refill water reservoir, requiring no plumbing. This provides the flexibility to locate the unit wherever it makes sense. Other features include variations on grinds, touch controls, milk steamer, and dual burners to allow for precise temperature control. 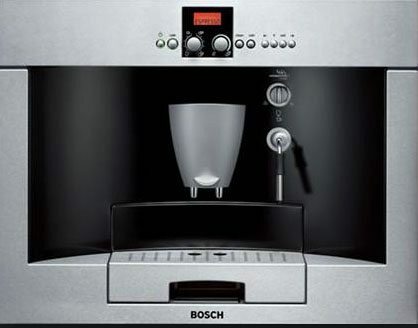 Bosch’s Benvenuto Built-in Coffee Machine (top left) works with either ground or bean coffee. Its primary feature is the Aroma Swirl brewing system, which extracts maximum flavor by surrounding grounds with water and brewing in a pressurized chamber. Like the Jenn-Air machine, the Bosch unit does require wiring or a 120-volt convenience outlet to operate. Wolf Coffee Systems (below right)also clear up counter space and offer similar brewing options. Brewing and clean up is a push-button operation, and requires no special plumbing. Wolf also offers an adjacent accessory cup warmer to maximize the barista experience in your home. Top German appliance maker Miele (below left) offers an option for direct water plumbing or refill container. Known by many for its Nespresso capsule coffee makers, the Miele built-in coffee maker offers a host of features beyond the standard, including an integrated milk tank for perfect cappuccinos as well as an LCD display that will talk to you in 21 different languages.